Capital Roofing Centre's new fleet flagship features a bespoke body design built in double-quick time by Bevan Specialist Products. The family-owned operator is based in Stoke-on-Trent and supplies a comprehensive range of materials to professional roofers and DIY enthusiasts throughout Staffordshire, Cheshire and beyond. Based on a 26-tonne DAF XF 510 chassis supplied by local dealer Imperial Commercials, the truck is equipped with a rear-mounted Atlas 135.2E crane which works with a brick and block grab. Bevan's dropside body, meanwhile, features a gantry platform with conveniently-stowed, retractable step ladder - a sensor sounds an alarm if this is not folded away correctly before the vehicle moves off. Capital Roofing Managing Director Wayne Johnson came up with the idea for this unusual installation, which affords operatives quick and easy access to the vehicle bed without having to drop the sides. The bodybuilder then turned it into a reality. Although only 12 months old, the radio remote-controlled crane was removed from a previous vehicle prior to installation on the new one, which also required a sub-frame. This process took significantly longer than planned. As a result, when the vehicle finally arrived at the Bevan Specialist Products' base in Wednesbury, West Midlands, for fitment of the body, the pressure was on to achieve a quick turnaround. The Bevan team pulled out all the stops to help their new customer, completing the project in just four weeks. "They pushed it through their system very quickly and we couldn't have asked for a better service," said a delighted Mr Johnson. "Bevan were recommended to us by the truck dealer; this was the first time we'd used them but I certainly won't be going anywhere else in the future." In addition to the dropsides and bed, the front and rear bulkheads are fabricated from aluminium rather than the more conventionally used steel, while extensive use has also been made of stainless steel fixtures and fittings. "Presentation is all-important, so we wanted to keep the vehicle looking as good as possible, for as long as possible," explained Mr Johnson. "Steelwork can become shabby over time, while standard bolts tend to rust and could easily spoil the vehicle's white paintwork." Bevan also painted the vehicle before its Graphics team applied the operator's eye-catching livery. 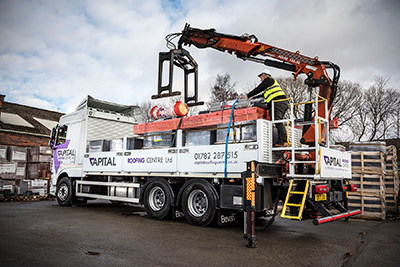 The truck now doubles as a highly-effective mobile advertisement for Capital Roofing Centre's business, when it's out and about six days a week making deliveries of everything from roof tiles and slates, to guttering and skylights. Mr Johnson, whose wife Pam is also a Director, and brother Matt the company's Logistics Manager, added: "Not only did Bevan complete the job quickly, but they also did so without compromising quality. Our new truck is clearly built to a very high standard and we couldn't be more pleased with it." A separate division of the award-winning Bevan Group, Bevan Specialist Products designs and builds bodywork which is tailored to meet the precise needs of operators.